A Cake Bakes in Brooklyn: Scandinavian Christmas Cookies: "Little Jewels to Grace Your Table"
Scandinavian Christmas Cookies: "Little Jewels to Grace Your Table"
"They sparkle like little red and green jewels & your guests will love them," noted the late Olive Facey on this recipe in her collection. She was right. These may be the perfect Christmas cookie. Light and delicious, these aren't overly sweet or cloying like so many holiday cookies. 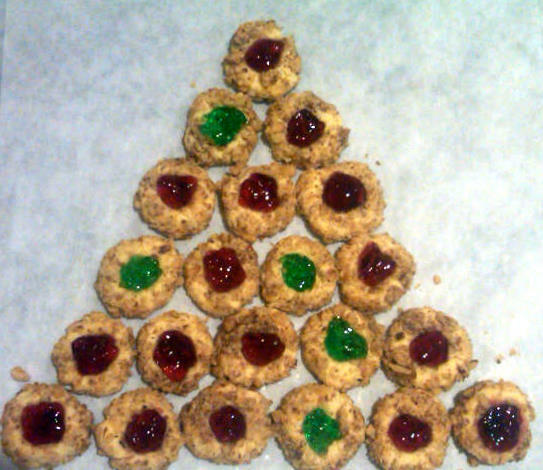 Couldn't resist creating a cookie tree with these. The Scandinavian Cookies in this recipe are also known as thumbprint cookies, as the depression in each cookie is made by pressing one's thumb into the dough. They are then baked and the depression is filled with jelly when they've cooled. 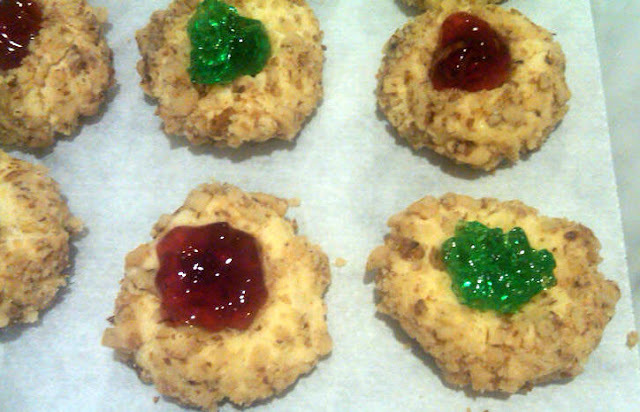 Once the jelly is added, the cookies should be served the same day. 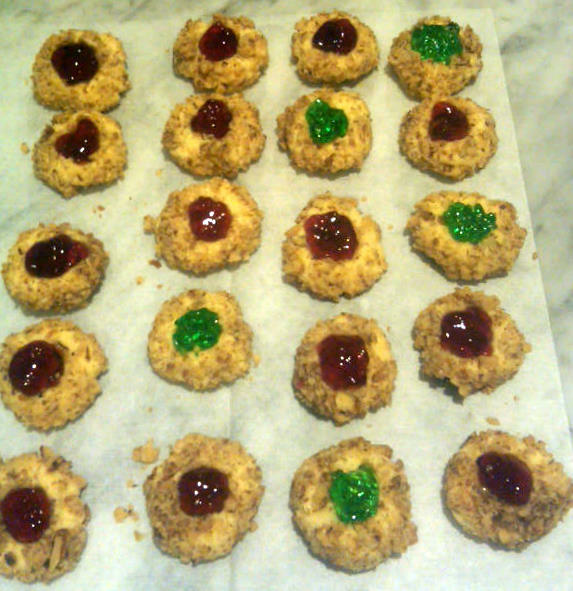 As per Olive's instructions, I used both red currant and mint jelly. 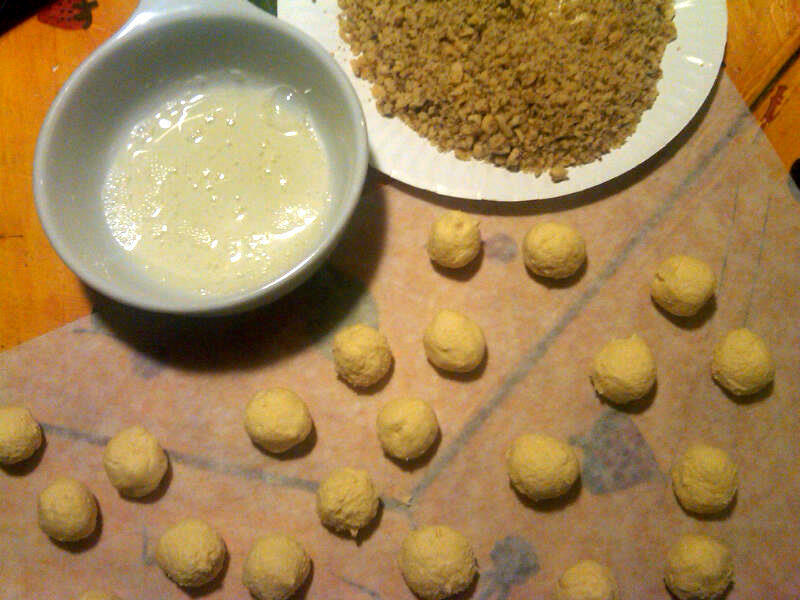 The mise en place for coating the cookies with egg white and chopped walnuts. Although there are several steps in making these cookies, all are simple and straightforward. In fact, these are the perfect cookies to make with children. The only tricky part is rolling them in the egg white and then the chopped nuts. It's most efficient to do the egg white part exclusively with your left hand, while the coating with nuts can be handled with your right hand. 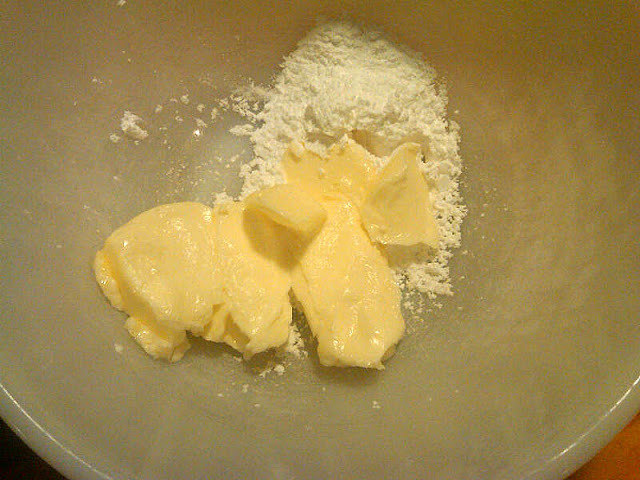 If you don't keep these operations separate, the nuts will invade the egg white mixture, making quite a mess. But if you have a young helper, the tasks can be easily divided. It's easy to overbake these cookies, as they don't really brown much. It's best to pull one from the oven to test after about 12 minutes. Overbaked cookies (as mine were) are a bit crumbly in texture, though still quite delicious. but are perfect with sweetness added by the jelly. Hi Susan, I just found your blog and I am so glad I did. 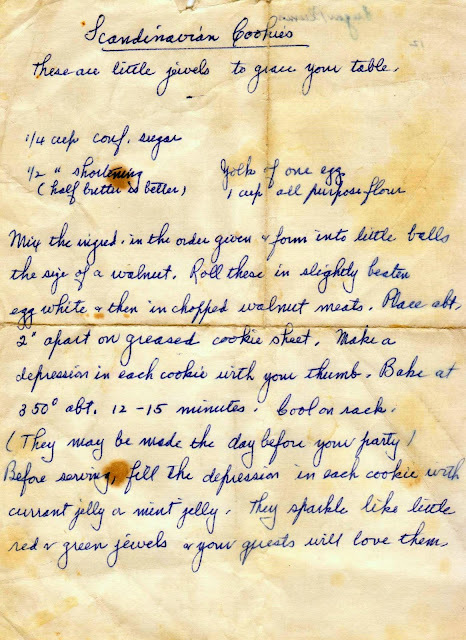 Your creations look delicious and I, too, love baking from old recipes. I look forward to seeing what you bake up in the future! 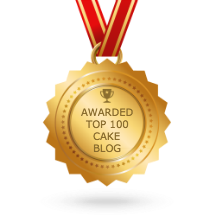 Bry: Glad you found A Cake Bakes and welcome. Let's raise a (depression) glass to toast vintage! Hmmm...This Christmas going to be rock. Will have to try scandinavian. Thanks, Top 10 Lists. Please report back!